Can you recall the exquisite delight of your first anatomy class? The wonder and respect as you peered into a body and saw bits that could be linked to names and function; the muscles and tendons, nerves and joints that linked to the structure of your own body like a life-size jigsaw? Anatomy is such an important basic science behind rehabilitation. If there was a ‘rehabilitation guild’ responsible for keeping the secrets of the profession, anatomy would be the most carefully guarded knowledge. Anatomy has its own language with echoes of the ancient past and at times seemingly impenetrable grammar and syntax– extensor carpi radialis, flexor digitorum profundis, substantia nigra and so on. For better or for worse, more than any other basic science, health language is constructed around anatomy – it’s deep in our bones. Anatomy offers much for technique and understanding. Interestingly, I’ve spoken to many clinicians over the years who have remarked that they wished they had learnt anatomy after they had started touching and treating people – to be able to move a joint or glide a nerve in a living body and then go and check it out in the lab to see what was happening on the inside. With university cuts to anatomy classes, such knowledge may truly become secret. Quick, which muscle in the body can contract to 10% of its length? There is only one and that is the iris of the eye (actually 2 muscles). The inner ring of the iris is crenelated with about 70 folds like an accordion. This ring is known as the pupillary ruff. Your pupils are probably around 3mm across right now, but they can get to almost a centimetre across – this was a real secret until flash photography. Google pupillary ruff and check out the great ruffs. I have always observed pupils for odd shapes and sizes – I couldn’t help it after I once noted that a person with severe low back pain had a pupil completely flat on one side and rounded on the other – their ruff was in spasm. If I do an Upper Limb Neurodynamic test, I can’t help looking into the eyes – the pupil flares with pain and sometimes seems to flare in anticipation of pain. The pupil is a part of an integrated defence detection and response system as the organism works out “what is going on”. I wonder how much the shape, size and responsiveness of the pupil could be a measure of what else might be going on in a person’s life? So many things are now known to influence pupillary size –intellectual reading material, cognitive demand, emotions, lateral gaze, light of course, and pain. Movements may too – there are reports of neck flexion causing pupillary flaring, but otherwise there is not much in the literature. Next time someone is in pain, peer into their eyes, check out their ruff and let us know if there are any odd pupil shapes or marked left right differences. It may well be a novel research area. Plus looking into someone’s eyes evokes a healthy oxytocin release for both of you. What a name! I was always intrigued by the difference between a group of patients who could quite easily elongate their upper cervical extensor muscles (“pull your chin in”) and another group where upper cervical flexion was particularly sensitive and easily evoked headache. The repeated clinical anecdote is that the second group can flex their upper cervical spines more easily in sitting or even better, in supine with their knees flexed. This may well unload the myodural bridge. 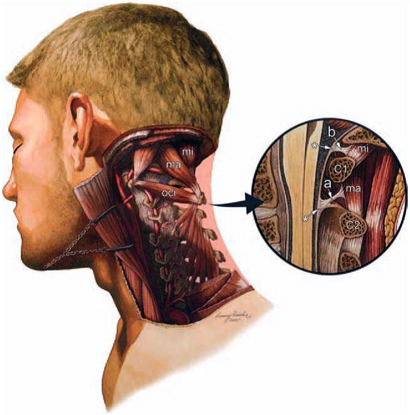 Myodural bridges are connections between the cervical dura mater and the cervical extensor muscles. These connections probably anchor the dura and stop it folding in on the cord when you look up and extend your head back (Hack et al 1995, Rutten et al. 1997) – this may have been an evolutionary advantage to our ancestors as they gazed up in awe at the firmament! There is a great recent review out by Enix et al (2014) updating the anatomy of the bridges including sub occipital bridges and proposing clinical implications. Think of it next time you’re having a look at a patient’s posture as they sit in front of you with their worries and concerns – or ask someone to tuck their chin in. It also remind us that everything is kind of joined up in the body – discrete anatomy is for the textbooks. I wouldn’t be where I am now if it wasn’t for my love of Anatomy. It’s rusty these days, when I’m not teaching anymore (Leaving that to the youngsters now ) but Netters is always open to help patients understand parts of my narrative. Often, I feel that Anatomy can be the King Pin in the patient getting “The issues in the tissues” part. I have to pay tribute to Warrent Officer Lee Panther RAMC, my Anatomy and Electrotherapy teacher. Lee made the subject fascinating and did you know that :- The fibula is the weight bearing bone in the elephant, and that the Brazilian fruit bat doesn’t have a Popliteus Muscle ! That is most intriguing about the Brazilian fruit bat David!. I can still remember being amazed at how big and thick and ropey the sciatic nerve was in cadavers. I had always imagined nerves as being tiny ,almost invisible.